CompHobby!org everything I know is borrowed... Steel Cyclocross from Nashbar – ComphHobby! I bought this particular bike because I wanted something that would be able to stand up to the not so smooth streets of Baton Rouge Louisiana without having to spend a tremendous amount of money. I liked the idea of a steel frame which in my experience makes for a very capable multi riding styles bicycle. I did swap the wheels and tires. I am now running on Continental Grand Prix 4 Season tires with the Vuelta Corsa HD Road wheelset and while weight conscious people would call the bike a tank I think it is an excellent balance between performance and durability especially considering the poor quality of streets and roads in this town. 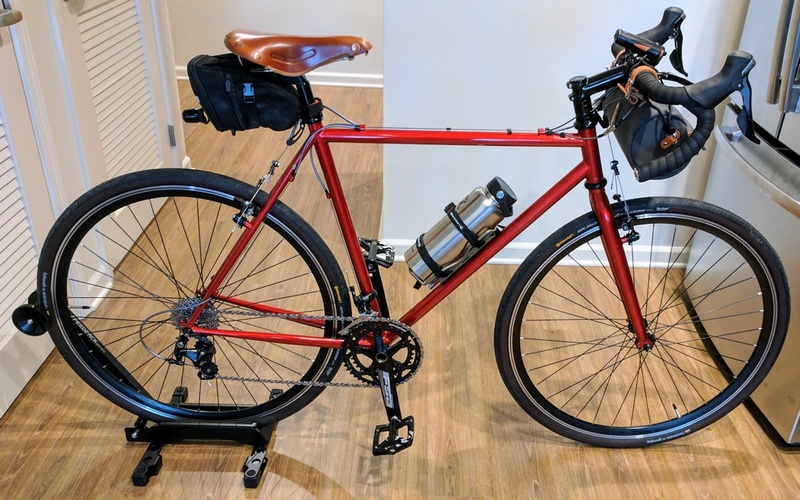 I did change the saddle to a Brooks Team Pro Chrome, added Nashbar’s Verge Platform Pedals, and swapped out the brake pads with some Kool Stop V-type holders and pads (which although not the stock type work beautifully). All in all I couldn’t be happier with this bike especially after I got it tricked out to my preferences. It is an excellent multi speed city cruiser priced good enough (when on sale) that one can set it up exactly the way they think it should be without breaking the bank. Note to anyone watch Nashbar site for sales if buying a bike prices are very fluid don’t pay top price wait. ← Back Again Cloud Powered…..